Today being Monday, we did our in town chores. Today being six months since my last teeth-cleaning was also my dental appointment at 8:15. So we postponed breakfast until after the dentist. We had another good sit-down breakfast at the Suomi in downtown Houghton. After that we drove to campus where I dropped Alice off, and then ran around town looking for a pick-a-roon. 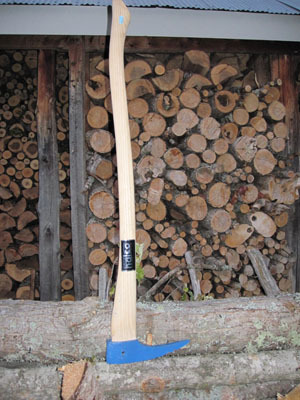 This is a tool used by woodsmen to move heavy logs around. It had an ax head on one side, and a long thin pick on the other, which you would drive into the log so you could lift or shift the log without bending over so much. This year I am looking for ways to not wreck my back during the step of shifting the logs from the forest floor onto the forks of the dozer. I went to all 3 hardware stores in Houghton/Hancock, and found no such tool. I know I’ve seen one somewhere, but could not find one to save my soul. After my third try I called my friend Mike Gretz to see if he could get away for a couple of hours of sailing. He said yes, so we jumped on his lovely sailboat for 3 hours of perfect sailing. The wind was about perfect, the conversation good, and nothing broke. 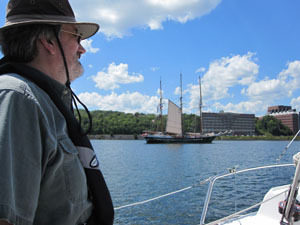 To top it off, on our way back the tall ship that is currently in Houghton was on the canal, and we were able to drive by and get some pictures. Once back on shore, I met Alice in her office, and used her phone to call my last resort hardware in Calumet. They said they no longer stocked pick-a-roons, but had some hook-a-roons in stock. These are similar to their older cousins, but lack the ax head. We drove up to Calumet and bought one of their two remaining ones. For those of you that live near the Copper Country, the hardware in downtown Calumet has almost never let me down. These guys know how to run a hardware. It is a pity they are so far away from us. We didn’t get home until almost supper time, and what with chores and odds and ends, the day was pretty well shot. Hopefully I’ll get the remainder of the logs on the trailer cut, split and stacked tomorrow so I can go back out and get myself another load of logs. I predict they will practically fly onto the trailer this time, aided by my brand new hook-a-roon. This entry was posted on Monday, July 26th, 2010 at 10:13 pm and is filed under Uncategorized. You can follow any responses to this entry through the RSS 2.0 feed. You can leave a response, or trackback from your own site.